We have all the Renaissance Festival Drinking Glasses and Tankards. We have many choices of drinking vessels for your Renaissance Weekend Experience in our inventory. Enjoy your ALE! Choose from a large Mug or Tankard or a More Royal Chalice or Goblet to store your drink of choice! Oh, by the way, get Ren Fest Outfits to match your Drinking Vessels. From Royalty to Riff Raff, we have the Costumes & Accessories you need. Make Gift Giving easy with these Gorgeous Historical Design Tankards. We also have Chalices, Keepsake Drinking Vessels and Accessories for Costume Ideas, We have the lashings so these Medieval Celtic Knot Designs & Celtic Cross decorated Mugs become part of your fabulous costume. 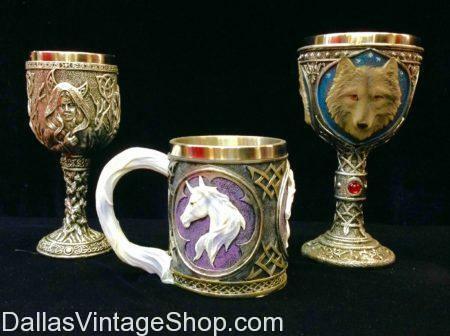 We have the most Magical Unicorn Chalices & Souvenir Mugs you have ever seen. If you need Gift Ideas, Props or Costume Accessories then you have to see these in person. We have complete Medieval, fantasy or Renaissance Maiden, Lady or Princess Outfits too. Need Gift Ideas or Costume Props and Accessories for your Medieval or Renaissance Outfits? These Historic Period Chalices & Tankards are just a sample to the huge collection of Period Goblets, Challaces, Tankards and other Drinking Vessels we keep in stock all the time. Get an entire outfit or just the pieces you need. For all the best in Historical Period Chalices, Goblets & Tankards, you must see our huge and diverse collection in stock always. These Celtic Period Drinking Tankards are only a sample of what we offer for your Gift Giving Ideas or Celtic Costume Accessories. 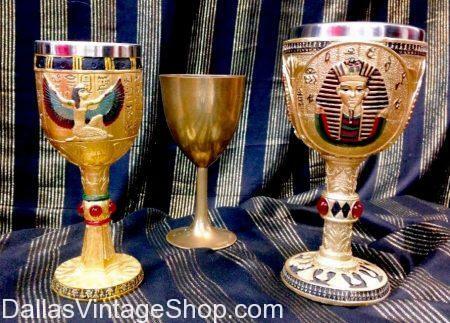 We have Decorative Egyptian Chalices & Goblets like these for the Pharoahs, Cleopatra or Nefertiti. We have drinking vessels for costume props or for displays for any historic era. We have a huge selection of gaudy or simple Egyptian Style Jewelry and fabulous costumes too. 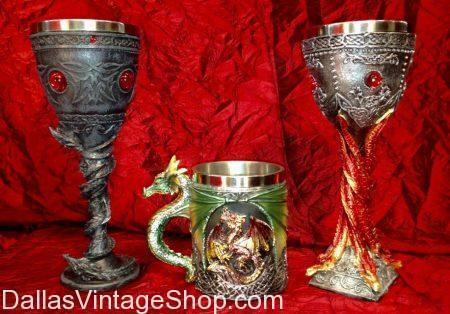 Accentuate your Medieval Fantasy costume or display with these colorful, detailed Medieval Dragon Chalices & Mugs. They also make a great gift idea for the Medieval, Fantasy or Ren Fest lover in your life. We have Complete Costumes or just the Chalices and Accessories you need for any Era. Take your Pirate Costume to the next level by adding thes Pirate Tankards, Mugs & Drinking Vessels to your belt. We have the Tankard belt holders and lashing you need as well as any Costume or Costume Accessory you have ever imagined. An Etched Celtic Cross Chalices and Pattern is jut one of many high quality chalices we have available. An etched design, fur, leather, or silver plated Celtic cross added to a chalice base will create a very unique look. Perfect for your next Celtic Festival. Complete your costume with drinking vessels of any era. From elaborate to simple, Royalty to Riff Raff, from tankards to chalices, we have what you need, including leather strap mug and chalice holders for your belt.. These Medieval, Viking Tankards, Chalices & Goblets are just a sample of the many choices you have here. You are in Chalices category.